There’s no greater joy than that of drinking with your BFFs, but what about your Pet Best Friend — your PBF? Sure, you can go drinking with your regular human friends, but your PBF is always glad to sit quietly by you, enjoy your company, listen to your stories, and offer you the kind of comfort that only your pet can. However, few establishments allow you to bring pets inside, which is understandable… even though it sometimes feels like species-discrimination. Anyway, we’ve taken the liberty to compile a list of Melbourne’s best drinking holes where you can take your pets along! Madame Brussels is a high concept eating joint located in Bourke St designed in a kitschy style with faux-grass flooring, furnishing that seeks inspiration from a diverse range of influences, and a pretty rooftop terrace. Madame Brussels is known for a vast number of original cocktails which you can and should try out. You’re allowed to bring your dog into the establishment if it behaves well and doesn’t try to lap up the other guests’ drinks. No one appreciates a boozy pooch. 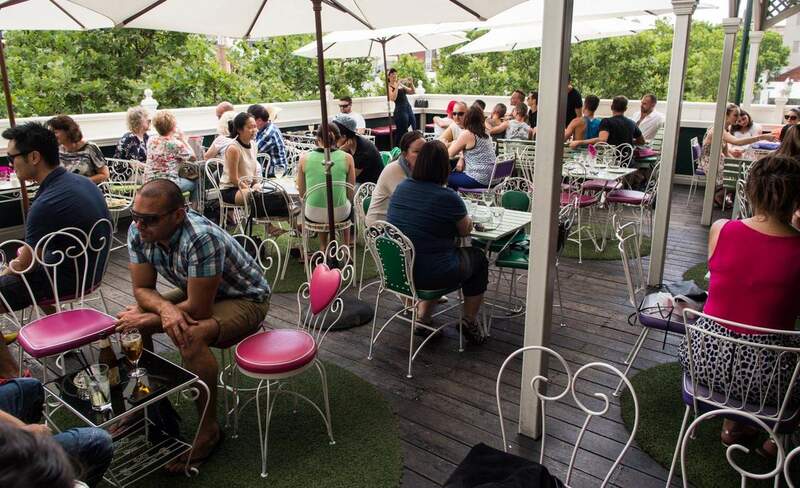 Rooftop Bar, as the name suggests, is one of the best rooftop bars in Melbourne, offering a sweeping panoramic view of the whole city skyline. The general vibe of the bar is quite chill and relaxed. The music isn’t too loud, and as such it has the perfect ambience to hold conversations. While they have a great rooftop bar with a nice selection of cocktails, they’re also famous for their burgers. You can bring your dogs along during the daytime, however you have to keep them leashed. Palace Hotel features one of the best dog-friendly bars in Melbourne. The hotel’s in-house bar is so pet-friendly that it even comes with a four-legged staff member called Billy the Staffy. One of the best features of the bar is the beer garden where you can enjoy a drink while surrounded with plants and vines. If you want to take your little pooch to eat out by the beach, there’s no better place than Republica. This place offers you a stunning unhindered view of the St Kilda Beach and the surrounding Yacht Club. It’s open quite early in the day, which makes it great for brunches as well. You can either dine out at the restaurant with your pet, or you can take a stroll or lounge around by the beach. Great Northern Hotel was founded in 1883, and it’s located on a bustling street in North Carlton. 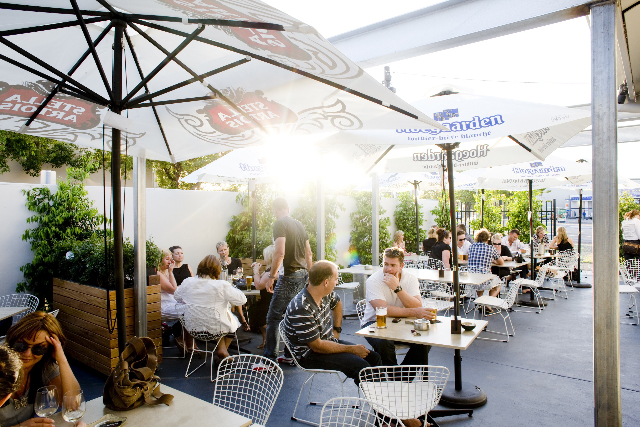 The hotel has one of the most spacious beer gardens in all of Melbourne where you can also bring your dogs along. In addition to being vast and picturesque, you also get a large variety of options with the choice of 22 beer taps. If you’re looking to take your pooch to a neighborhood pub that feels distinctly Australian then Monty’s is the ideal choice. This is a moody bar with the general vibe of an outback pub. All the beer options available here are locally sourced, and the walls of the pub are lined with prints of the Australian countryside and landscapes. Even the potted plants in the establishment are native Australian. The Fox is quite an eclectic little bar located in Collingwood. This is perhaps the only bar in Melbourne where you can come with your drinking buddies, or your kids, or your dogs, and they’ll all feel equally at home. The bar feels quite a lot like a man cave with the walls etched with graffiti and lined with old faded posters and beer cans. There’s even a little spot for a ping pong table if you’d like to take a break from drinking and enjoy a little game. The rooftop patio offers great views of the neighborhood, and the beer garden is a great spot to drink with your pooch. The Union Club Hotel’s bar is designed in quite an old-school aesthetic with the walls lined with vintage oil paintings, and classic rock music always playing in the background. However, if you’re bringing a pooch over, you’re going to love the beer garden out back where you can hang and spend time with your dog. Well, these are some of the best drinking holes in Melbourne for those who can’t be separated from their pets. Now we’ve given you a good excuse to pub crawling with your dog in tow – responsibly of course!